Ever since there have been tattoos, there have been a need for tattoo cover up. There are many reasons why people want to cover up tattoos. Unfortunately, there are only a few different ways to use tattoo cover up to effectively hide your tattoo. Depending on the placement of the tattoo, clothing is often the most popular, easiest and relatively inexpensive option for tattoo cover up depending on your style. If the tattoo is on the chest, for instance, simply wearing a t-shirt will conceal the tattoo. However, this is not an appropriate option for every occasion such as a day on the beach. Until recently clothing was the only option to hide a tattoo. However, tattoos on the hands, neck or face are often too difficult to cover up with clothing. Specially made tattoo coverup sleeves have also been created to cover up arm and leg tattoos. Common complaints with tattoo coverup sleeves are that it is hard to match specific skin and that it is too hot, even when made from well-ventilated materials that “breath”. Other complaints are that it is quite obvious that you are hiding a tattoo. Tattoo cover up makeup, not be confused with tattoo makeup, is a popular and effective way to temporarily cover up a tattoo. For many reasons, using a tattoo concealer is the option we recommend most, as it can be used to effectively and temporarily conceal your tattoo for any occasion in any environment. With makeup the cover up is only temporary and it’s flexible texture can be made to look like your real skin, so you do not have to wear heavy and hot clothing. However, tattoo cover up makeup is a little different than applying normal makeup like you would to your face. For example, the makeup is usually made at a little thicker consistency when in a liquid foundation form, or carries relatively the same consistency as most of your average makeup concealers. Poorly done, very faded or very light tattoos with black inks are the easiest to cover. One of the key ingredients in tattoo cover up makeup is special minerals known to bend and reflect light, which are crucial for concealing vibrant inks in many modern tattoos. Our Ferbs Cosmetics tattoo cover up makeup contains a proprietary blend of select minerals directly within the makeup, while other products require the use of a separate “tattoo primer” makeup product that you rub over your tattoo before applying the tattoo coverup makeup. In a pinch, certain lipstick has been known to work in place of a tattoo primer. To begin, check to see if your cover up makeup recommends that you first apply a tattoo primer as the first step. If so, completely cover the tattoo with tattoo primer. Next, to apply tattoo coverup makeup that is in liquid foundation form such as Ferbs Cosmetics Tattoo Undercover, start by squirting a small amount of the tattoo cover up makeup directly in the middle of the tattoo. 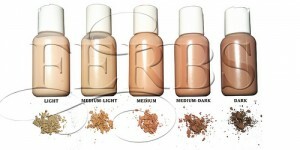 Remember with Ferbs Cosmetics temporary tattoo cover up makeup, even a little bit goes a long way. Start from the middle of the tattoo and extend long, even brush strokes about a half inch or so past the edge of the tattoo. Allow each layer to dry completely before applying the next layer. Do not try to completely cover the tattoo or the tattoo cover up primer in one layer and instead remember that more thin layers dry faster than fewer layers that are thicker. To speed up drying time you may want to use a hairdryer on the low setting. After the tattoo is completely concealed (usually 3-4 applications) and the makeup is completely dried, lightly dust the setting powder over the tattoo using a powder brush to blend the tattoo cover up makeup with your skin tone exactly. This crucial last step locks the tattoo cover up makeup in place and keeps it from rubbing off on clothing. 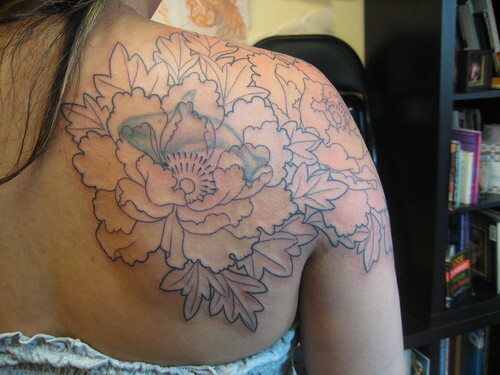 For more in-depth directions and help covering a tattoo checkout our tattoo cover up directions. With Ferbs Cosmetics temporary tattoo cover up makeup products, even inexperienced makeup users can easily cover their tattoo. Our proprietary tattoo cover up make up formula has a thicker consistency than most of the competition, requiring fewer layers that dry faster and is waterproof. Simply remove with baby oil. Ferbs Cosmetics Tattoo Undercover temporary tattoo cover up makeup comes in 5 different skin tones and is a two-step process. Use several applications of the Tattoo Undercover temporary tattoo cover up liquid foundation to cover the tattoo before applying Alibi Setting Powder to lock the cover up in place and match your skin tone perfectly. Make sure to take a look at our before and after tattoo cover up pictures. When people are happy having a tattoo, but not happy with the tattoo they currently have, they may opt to have a new tattoo cover up an old tattoo. In most cases, the artist incorporates the old design and colors into the pattern of the new design, so it is hard if not impossible to decipher what the tattoo looked like beforehand. 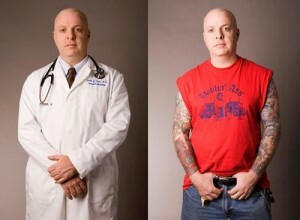 Incorporated tattoos more often turn out as better cover up jobs. When coloring the new tattoo most artists try to use high contrast colors to lead the eye around the new tattoo, distracting the eyes from where the old covered tattoo is. This ultimately will still leave you with a tattoo, which is great if you are still happy sporting a tattoo. Using a new tattoo to cover up an old tattoo may require several treatments and the cost of the new tattoo. The new tattoo cover up that is covering the old tattoo is always larger, usually three to four times the size of the original tattoo. It usually requires much more skill from the artist to incorporate and hide your old tattoo into a new tattoo you will be happy with. Later down the road if you ever change your mind and decide to remove it or cover this new tattoo also, this usually makes covering up or removing the new tattoo with tattoo cover up makeup harder and more expensive than it would have been to cover up or remove the old tattoo in the first place. Much more vibrant inks that work well at covering certain tattoo colors need to be used when using a new tattoo to cover an old tattoo. Warm colors like red, yellow, and orange don’t work well for covering tattoos. Cool colors like blue, green, purple are best for tattoo cover up with a new tattoo. People often wonder if you can use white ink or a similar pigment as your skin tone when performing tattoo cover up with a new tattoo? Tattooing your skin tone to cover a tattoo will always present problems when your skin tone changes from things like the sun and is rarely if ever recommended. One of the main difficulties with using white ink to cover up a tattoo is that the white eventually settles in the same layer as the old tattoo colors and the old tattoo eventually begins to show through. When some artists are done with a session they have been known to tattoo white ink over any exposed parts to lighten the old tattoo. After your skin has finished healing it’s been tested and proven that white pigments can lighten old tattoo pigments around 10%. It’s never going to make a tattoo disappear completely, but if you are patient with a couple extra treatments it can improve to final outcome of your tattoo cover up. mark harada at mcdougal tattoo on sullivan st nyc. When choosing a new tattoo for tattoo cover up, the first step will be to meet with your artist and go over all the basics. Choose a professional artist with a clean shop, many good recommendations and artwork you like. Talk to the tattoo artist first and set up an initial consultation to ask questions and meet everyone. Many tattoo artists will take a picture of your old tattoo and begin to sketch out some initial tattoo concepts, both to get a feel for your old tattoo and to see what direction you will be wanting to go when designing your new tattoo. If the person is unhappy with the tattoo and is tired of finding different ways to cover their tattoo, one final option might be to remove the tattoo completely. Tattoo removal is not technically tattoo cover up perse, but is often an option that is linked to or confused with tattoo cover up. During tattoo removal, a patient removes their tattoo using creams, abrasives, and surgery or laser tattoo removal. Laser tattoo removal is often the most popular method of tattoo removal, but it often takes several laser tattoo removal sessions to remove a tattoo completely, and treatments can be expensive and painful. After the Ferbs Cosmetics team aided first-hand in over 30,000 laser tattoo removal treatments, it became clear there was a demand for tattoo cover up as well as tattoo removal. During laser tattoo removal, a high-powered medical laser shoots highly concentrated colored laser light beams into your tattoo and skin, breaking up the ink and allowing your body to naturally take the ink away in time. Usually the this process takes about 2-4 treatments for simple tattoos and 6-10 treatments done by professional artists with modern inks This process is spread out over 4-8 weeks apart. Treatments usually cost around $40-50 per square inch per treatment, thus removing your tattoo can take several treatments over several months and cost thousands of dollars. Laser tattoo removal patients often explain the feeling to be comparative to thousands of rubber bands snapping against your skin at once, but everyone’s pain tolerance is different and placement of the tattoo being removed is often a factor. Using a temporary tattoo cover up makeup in between treatments is often used to hide the tattoo while it is still in the process of being removed, although it is important to note that makeup should never be applied to open or irritated skin that is not fully healed. When choosing tattoo removal it is important to determine which laser tattoo removal facility is right for you as with any doctor. Again, you’re going to want to choose a clean shop with great recommendations. 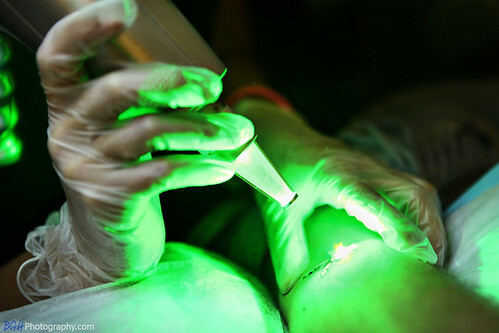 Doctors or Dermatologists who specialize specifically in laser tattoo removal procedures in addition to other tattoo cover techniques, or doctors specializing in laser surgery tend to be the most experienced and best candidates. Don’t always go for the cheapest tattoo cover up or tattoo removal option, since that is usually a warning that the laser tattoo removal clinic is using old, less powerful lasers. Old laser tattoo removal lasers require more laser tattoo removal treatments and have been known to leave tattoo removal scars. One of the tattoo removal laser on the market today that we feel is one of the best is the Hoya Conbio laser made especially for hair and tattoo removal. The lasers used during this process can be very dangerous and your eyes should be protected at all times during treatments. However, even with the recent improvements of lasers, the chance of scarring is always present and increases with multiple laser tattoo removal treatments. Not all tattoos can be removed completely and permanent tattoo makeup can be especially difficult to remove. Certain individuals with dark skin tones or sensitive skin may always need to rely on tattoo cover up instead. Candidates with fair skin and tattoos on the arms, chest, buttocks or legs usually experience the best results. Common side effects of laser tattoo removal procedures are typically far and few in between but could include hyperpigmentation (excessive color), or hypopigmentation (excessive fading) of skin. Other side effects could include infection and again, scarring. To prevent unwanted results it is recommended that ice in a washcloth be held over the tattoo immediately following contact with lasers, and topical antibiotic ointment is applied 30 minutes following the tattoo removal procedure. Of course meeting with your tattoo removal doctor and discussing risks will be the best way to determine if you might be a good candidate for laser tattoo removal instead of tattoo cover up.